Water Weight Calculator - How Much Does Water Weigh? Water Weight Calculator – How Much Does Water Weigh? Find how much water weighs given a volume in teaspoons, tablespoons, cups, quarts, pints, gallons, liters, or milliliters. The weight of a volume of water can be found given the density, which is the mass compared to the volume. The density of water is 1 kilogram per liter (kg/L) at 39.2°. 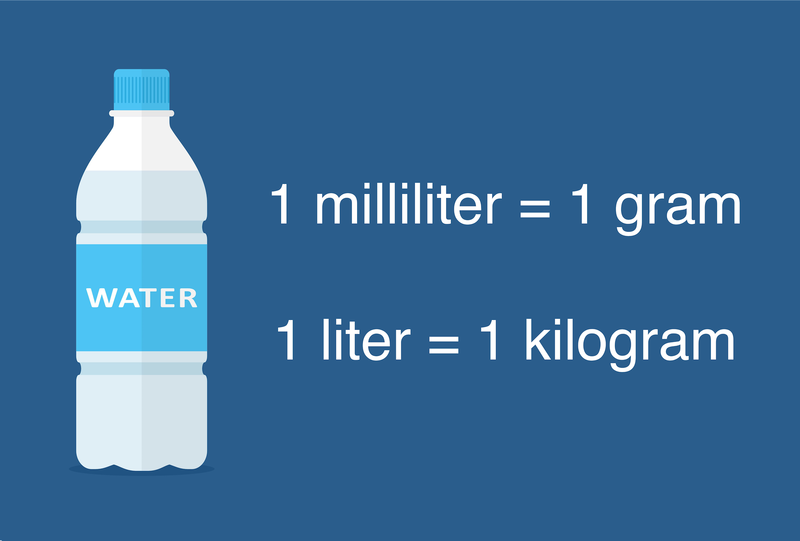 This means that 1 liter (L) of water weighs 1 kilogram (kg) and 1 milliliter (mL) of water weighs 1 gram (g). In common US measures, one gallon of water weighs 8.345 pounds. To find the weight of water, start by finding the density(1 kg/L at 39.2°) and the volume of water. Convert the volume of water to liters and then multiply by the density to find the weight. Use our volume conversion calculators to convert different volumes to liters. 1 gram is equal to 0.035274 ounces so to get a result in ounces simply multiply the grams by 0.035274. You can also use our weight conversion calculators to convert from grams and kilograms to pounds and ounces. Working on a plumbing project? Use our pipe volume calculator to calculate the volume and weight of the water in your plumbing system.